A brand-new PA offer has a twist: no book purchase necessary. Just a $49 fee (or $69 for the multi-book option). And who's the lucky celebrity? None other than world-famous author and digital pioneer J.K. Rowling. We will bring your book to the attention of Harry Potter's author next week while our delegation is in her hometown, and ask her to read it and to tell us and you what she thinks. Tell her what you think: in the Ordering Instructions box write your own note for JK Rowling, max. 50-100 words. We will include your note in our presentation for her! Word of this new "offer" quickly got out, prompting a discussion at Absolute Write and its very own Twitter hashtag. Now it seems that Rowling's management team has taken notice. The EIBF was first made aware of the letters being sent out on 23rd July, when one of the recipients passed it on to the organisers. The letter said: "Your book. In Scotland. Next month. Edinburgh is famous for its annual August downtown book festival where it is all about authors, writing contests, literary Nobel prize winners, and the general Scottish audience who come to see who and what is new in the English language. Big publishers are everywhere. Newspaper reporters are everywhere. The famous Guardian newspaper is a top sponsor. PublishAmerica is at the festival, promoting our best authors". The letter then offered its authors a choice of three options for them to buy space in a catalogue "that we will present to the festival". It is understood PublishAmerica sent out a number of different variants of this letter, offering access to Random House and the London Review of Books, among others. The Bookseller reports that the EIBF issued a statement in July to PublishAmerica authors denying the existence of a relationship between the EIBF and PublishAmerica, and accusing PA of "falsely portray[ing] the nature of the festival and the likelihood that the purchase and inclusion in the 'Scotland' catalogue will result in attention from the Festival and/or publishers" (the statement was also sent to Pen America and the Society of American Authors and Writers*). which the publisher responded to by denying their letters implied anything would result from inclusion in their catalogues. The PA letter said: "Furthermore, none of these things imply any results from inclusion in the catalog. Thus, your characterization of PA's advertisement is unsubstantiated; PA is simply not promising any level of attention by EIBF." In other words: Don't take that tone with us. Will there be a C&D from Rowling also? Stay tuned. * I'm not familiar with a writers' organization by this name. I wonder if what's meant is the American Society of Authors and Writers (AmSAW). If so, the EIBF wasted a statement, because despite its claims to be "the number-one society of media professionals in the world," this is not a recognized professional writers' group. 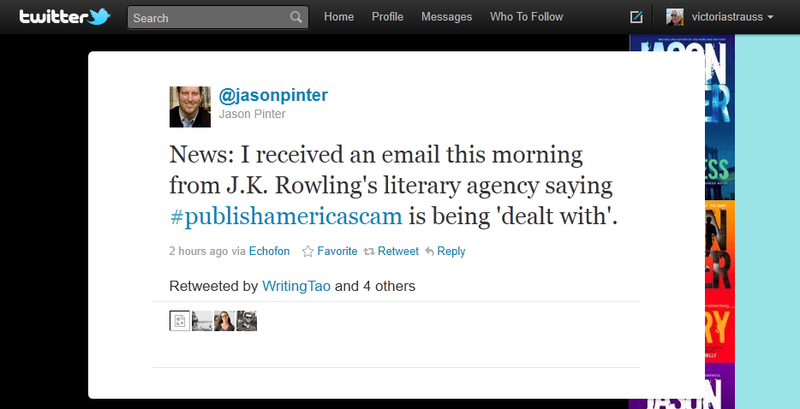 EDITED TO ADD: Rowling has responded through a spokesman. "Rowling spokesman Mark Hutchinson said Tuesday that the claim was 'completely false' and promised 'appropriate action.'" EDITED AGAIN TO ADD: The link to the Rowling promotion is no longer active on PA's website, but here's a screenshot of the Google cache. "Furthermore, none of these things imply any results from inclusion in the catalog." That's PA all over - "none of thee things imply any results". The ONLY result you can be sure of is authors being a few hundred dollars worse off. "Thus, your characterization of PA's advertisement is unsubstantiated; PA is simply not promising any level of attention by EIBF." If there was no certainty of attention, why was the EIBF name used at all? Because it looks attractive to authors and makes them reach for their credit cards quicker. Thanks for keeping us informed of the bottom feeders who prey on writers. Too bad white-collar crime doesn't merit more attention in the legal area. It always pays to inform yourself when someone is asking for money. There should be a class action law suit for the people who have bought these marketing packages based on ridiculous claims. It's about time someone put their foot down with company. They have damaged the publishing industry quite enough over the years and make it hard to recommend self-publishing to new writers with a straight face. Seriously, when will people learn? JK Rowling's team does not play around. Anything that threatens to tarnish the brand is almost always dealt with swiftly and brutally. So I'm quite certain PA will be getting the smackdown they deserve. I wish was a fly on the wall. If you look carefully at the AmSAW page, you'll find sponsor links to a certain agency? I've had a bad feeling about that one for awhile. This is really scary. Thank you so much for keeping us all aware of such crimes. 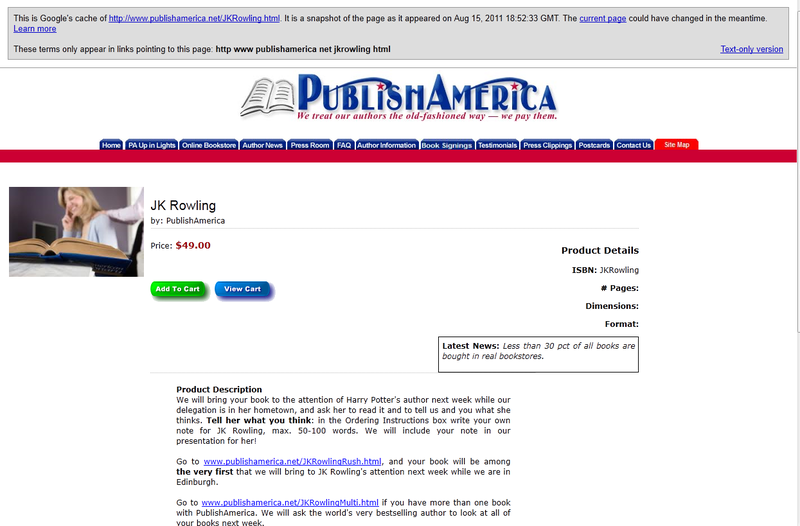 PublishAmerica: "Oh, gee, we sent your book to J. K. Rowling and asked her to tell you what she thought of it, but I guess she was just too mean to take the time to help you. Now buy something else!" Hey, folks, just send me a buck two ninety-eight and I'll ask some of the greatest authors of all time what they think of your book! William Shakespeare, Jane Austen, Arthur Conan Doyle, you name it--I've got a Ouija board and I'm not afraid to use it! I can guarantee that my results will be at least as effective as the results of any and all PublishAmerica "We'll send your book to a famous author" program. "If you order X amount of books we'll send your book to a famous person and they'll tell you what they think." If it looks like a rip-off, smells like a rip-off then it's a rip-off. A writer would have to be some kind of desperate to fall for this Shtick. PublishAmerica must be some kind of desperate now and is trying to wring the last cent out of the few suckers who are dumb enough to use them. Most celebrities and best selling authors like J.K. Rowling don't read unsolicited ANYTHING. At best it winds up sent back Return to Sender by their assistant, at worst it winds up in the trash. Unless their agent or an editor at a publishing house presents it to them, (usually after the writer signs a release) they won't take a look at it. Even going near unsolicited material leaves a celebrity WIDE OPEN for a lawsuit, which is why many avoid going near the work of other writers at all costs. I'm trying to understand how anyone could even begin to believe Rowling would participate in this. Just boggles the mind. This is truly mind-boggling, but you have to understand that the main reason many people end up being "published" by PA is that they don't do their homework first. They just google something like "publisher for new writers" and choose PA because, unlike the other vanity presses such a search will produce, PA doesn't ask for money upfront. Visit the PA message boards or read the PA threads on absoutewrite to get an idea of how very, VERY naieve many PA writers are. They don't know how real publishing works and regard attempts to educate them as personal attacks. They lack the initiative to visit the websites of J K Rowling, Stephen King, Clive Cussler, Oprah etc, all of which state clearly that unsolicited books and manuscripts will not be looked at. They don't appear to visit bookshops, none of which stock PA titles and all of which stock books by first-time authors who have achieved what PA claims to be an almost impossible feat - being published by major publishing houses. And quite frankly, some of the most deluded PA scribes seem to be borderline illiterate. Let's hope that PA's latest and most stupid stunt will prove to be a costly and humiliating mistake! J. D. Atkinson - true. Yesterday I was talking to a PA author via Facebook. He'd paid PA $49 to upload his book to the Kindle, where they priced it at $26, but he defended PA on the grounds that they didn't charge for publication. I said that in publishing or self-publishing, there was no cost to the author to have a book on the Kindle. His response? "The $49 was worth it to me." Who knows, maybe the authors who bought into the Rowling scheme believe the $29 (plus s&h) was worth it to them. Sarah Joy, an associate agent-in-training. I can't believe that anyone actually thought that JK would spend time reading other people's work just because she was 'asked to'. PA is clearly at fault for making the offer but come on people, have some sense of reality here. Did it even remotely sound like a genuine deal? Just wanted to let you know that Miguel de Cervantes and Harriet Beecher Stowe think this blog post is EXCELLENT! @Marian - did your PA writer friend say how may copies his $26 book has actually sold? I'm guessing it's non-fiction, right? Me - it's fiction about the Vietnam War. He didn't say how many copies he sold, but the paperback has an Amazon sales rank of over six million and the Kindle version has no sales rank. MORE.I HAVE ALL E-MAILS AND REPLY'S.I AM NOW AN EX-AUTHOR WITH PA.MY CHILDRENS BOOKS SIT ON MY DESK. I CHECK FOR NEW PROMO'S FROM PUBLISH AMERICA EVERYDAY---THEIR PROMO'S ARE CHANGING QUITE A BIT. THE NEWEST STATES FOR X AMOUNT OF MONEY WE WILL GET YOU BOOKS OUT THERE TO SWEDISH TV AND NEWSPAPERS AND ALL SCANDINAVIAN COUNTRIES. SINCE NO NAMES, IT IS IMPOSSIBLE TO REPORT THEM---SEEMS LIKE PA IS TRYING TO COVER THERE YOU KNOW WHAT. MORE NEW PROMO JUST OUT!!!! !NOW PUBLISH AMERICA'S AUTHORS CAN FOR $299.OO GET WEEKLY REPORTS ON STATUS OF ONE OF THEIR BOOKS FOR SIX MONTHS. People, its pretty obvious PA is a scam. Stop sending your books to them! I too am a victim of PA. I was once so proud that I could write with natural talent and now, I feel discouraged every time I start a book. My book Scarred Impressions was the first book I ever wrote of my personal transition from Las Vegas to Colorado. The one copy I saw that my sister bought was FILLED with errors. Every other word was misspelled such as: me instead of my, paints instead of pants, past instead of passed. I have tried to contact PA to get out of my contract and they threaten me with their lawyers. I am nearly ready to give up. I just want the rights of my book back; maybe then I can correct the errors myself. I left my story on bewareofpublishamerica.com and I am very interested in a class action lawsuit. Something needs to happen. DO NOT SIGN ANYTHING WITH PA! DO NOT SEND YOUR MANUSCRIPT TO PA! Please! Sen. Coburn's office needs your help. Any and All information, fliers, faxes, emails, statements, personal verified research, etc. that has been or is accumulated about PA is needed to aid in the investigation of PA and to initiate investigations from the State Department, Inspector Generals Office, Department of Defense and other agencies whom PA has claimed attachment to. Send everything you have to sekemia_mwonyonyi@coburn.senate.gov he also wants any Oklahoma resident who has or is having issue with PA to also send them what they have as well. Hope to be with you all at the finish line." "The office of Senator Coburn is not currently investigating PublishAmerica." I have an issue with America Star Books. I paid them $79.00 (admin fee) to release me from their contract (which I paid).They, in return, said this: "You own the unformatted text only, and you can do as you choose with that alone. America Star Books continues to own the ISBN number, the cover design, and the layout design of the text. Any use of any of these items would be a serious and very clear case of infringement. Therefore, you can use the same design only if we transfer the rights to you, or to your new publishing company." (Basically they're holding my book for ransom). Again, ABS says at the end of their email; "you own the unformatted text only, and you can do as you choose with that alone."